Most of us have a sibling. Maybe you think of them with annoyance, but siblings are actually pretty cool. Especially younger siblings. They're your mini-me, your shadow and your biggest fan all rolled into one small bundle of goodness. My little sister Grace is turning 9 in a little less than a week, and upon asking her what I should post, she suggested I interview her. I decided to jump on the idea and take the plunge. "Would you like to introduce yourself?" "Sure. Hi, I'm Grace and I'm 8 years-old. I was born in Nebraska." She pauses, trying to think of what to say next. " Are you putting my 'ums'?" She asks anxiously. I assure her I won't. "Did I say I was 8 years old? Oh, my birthday is February 2nd!" "What is something you love to do?" "Well." She pulls at the cinnamon gum in her mouth. "I like to play. And dress dolls." "What are three words to describe you?" "Who are some of your favorite people in the world?" "Well, you. Mommy, Sarah, God. Well, He's not really a person, so I don't know if you should count Him. And my friends." "What would you tell someone who was really sad, and couldn't seem to cheer up?" "For one, pretend you aren't sad. Try and do things that you really like to do. Like, drawing or reading or, like, anything really. And that usually helps me. Or even talking to a family member or a close friend." "What are your favorite movies?" "I like Tintin, Tangled, The Greatest Showman, Wonder, The Lion The Witch and the Wardrobe." "Why do you like those movies?" "I don't know. I feel like they're just really incredible. Everything they're doing, they're really well filmed. Oh, also The Incredibles. There's action in them, there's sad parts, and intense parts, and there are just parts." She laughs showing her missing teeth. "Everything in them goes together and you have to have all the bits of the movie, I feel like. You have to watch the whole thing to really get the story." "It's calming and sweet, I feel like. And every time I see it, it sends a nice calming feeling all over my body. It makes me really cozy," she says smiling to herself. As I write down what she said she leans over in her chair and whispers quietly, "I think I'm doing pretty good." "What is something you really like about yourself?" "I don't know. I feel like this is kind of braggy." She raises her shoulder in uncertainty. "You're fine," I assure her, smiling. "Um, probably, uh. I try to encourage my friends and family to do something er, to like help them if they're really scared to do it. And demonstrate to them how I do it." "A physical therapist. Because I had to go to physical therapy and I feel like it helped me SO much. Now I really want to help other people, too." "What's your favorite thing to pretend?" "Ooh." She smiles and wiggles in her seat. "That's hard! Probably that I'm a hobo in Kit's (an American Girl doll's) time period." "If you could make one wish for anything, what would you wish for?" "Oh my gosh, Ella. That's hard too!" She thinks for a moment before asking, "Can we come back to this? Well, I think my wish would be... Oh, wait. I know what I would want: to go to Disney Land." "If you could only keep 5 of your possessions what would they be?" "My stuffed panda, Kit (her doll), a pair of clothes." She counts them off on her fingers. "Uh, a pencil and an empty notebook." "How should I wrap up this interview? What do you think I should say?" "Um," she giggles, chewing her gum a little faster. "I don't know!" "Well, what would you say at the end of this post?" "You know what, Authur is on, so you might want to go watch that now." "Oh, okay. Thanks. That's what you should say: thank you. Thank you." She laughs, rushing to grab the remote. The afternoon sun slants in and reflects off her dirty-blond hair as she watches her favorite show. Do you have siblings? How many? What's your favorite color? Have you ever interviewed someone from your family before? Which was your favorite answer of Grace's? COMMENT BELOW AND CHAT WITH ME! This was such a cute post! And a great idea! :D My favorite answer was the one about her favorite thing to pretend. As a writer, I can relate. XD You can tell Grace that I liked her answers. Thank you, D. G! Ahhh, that was one of my favorites, too! Haha XD She said thank you! You're the absolute BEST EVER! Awww, that was really sweet, great idea! I haven't interviewed my siblings (I have 4, to answer your question) but I really should! AWWW I'M CRYING. This is so the sweetest thing ever, Ella! Her movie answer is hilarious! I have four siblings. And now I seriously want to go interview one of them, oh my goodness! This post was great, Ella! Tell her happy birthday for me, haha! OH MY GOSH THANK YOU, RILEY! :') Isn't she the cutest thing ever? Haha, wasn't it? I would SO read it if you do! Your comments always brighten my day. CUTE! This is such a nice thing for you to do. She can look back at this when she's older and see how she has grown. YOU could do a now and then post. This would be the then in the future! AHHH! Love it! Isn't she? That's exactly what I was thinking! It will be so much to look back on when she's older. THANK YOU FOR READING! Aw, this is so sweet! Your sister is precious! I have three sisters and one little brother. =) I love her answer to what her favorite thing to pretend is. I'm assuming that she means Kit Kittredge from American Girl? My sisters love AG! Thank you! Isn't she a doll? Aww, that's great! Haha, me too! She's always dressing up as one. XP Yep! Yes, she loves it too! THIS WAS THE SWEETEST. I love her replies. especially "what do you like about yourself" + "what five possessions would you keep." kids are the best, bc they are so honest haha. THANK YOU SARAH! Ah, me too! They really are. I'm afraid I take my siblings for granted far too often. Ahfjadsfjk, thank you! That was so sweet, Ella! 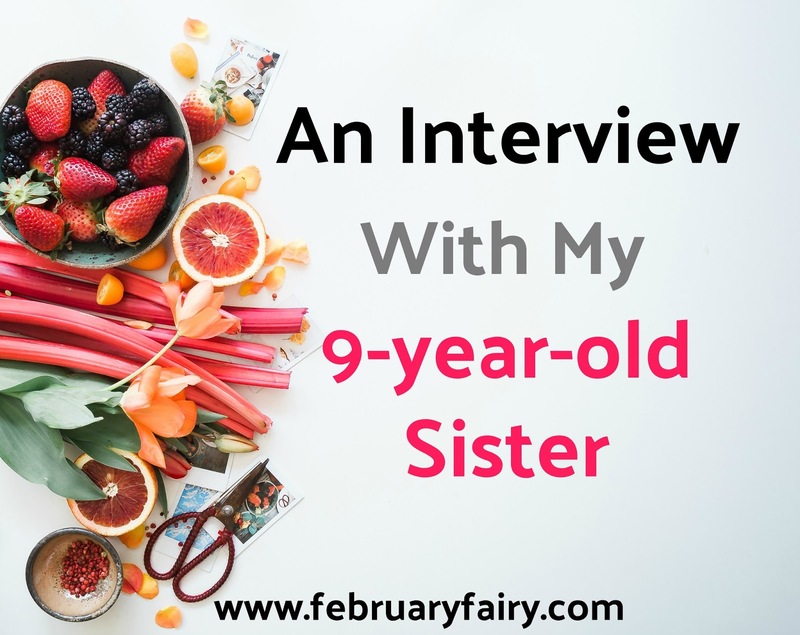 Yes, I have interviewed my little sister on my blog, and I also let my other younger sister do a guest post. I have four brothers and four sisters. Isn't she the sweetest? Ooh, I bet that was a blast. Wow, you must have a very busy household. Aren't siblings the best? OMW THAT WAS SUCH A SWEET IDEA! I've actually though about interviewing my sisters! (One of them is nine too ^.^) and hello Tintin and The Lion the Witch and the Wardrobe are TWO OF MY FAVORITES TOO!! ISN'T SHE THE BEST? I WANT TO HANG WITH YOU TOO! Gah, thank you Abbie! I was actually inspired by the interview Kate's interview with you. Thank you so much for reading and for your sweet comment! That was so sweet!!! I LOVE the idea of doing a interview with one of your siblings! AHH, THANK YOU SO MUCH LYDIA! This comment made me smile so much. Me too! Aww, you're too sweet. *blushes* Yes, I actually recorded it, so I could remember everything she said. This is so cute!! Happy birthday, Grace! Thank you, Hanne! I'll tell her you said so! Yay, I love Sarah's blog. YOUR COMMENTS NEVER CEASE TO BRIGHTEN MY DAY! I will definitely tell her you said so. Ooh, that sounds like fun! Ah, awesome! Aww, Elena, thank you for reading it! Isn't she the cutest? <3 Haha, wasn't it? Thank you, Gracie!! Ooh, you totally should! I have soon to be nine younger siblings! I loved this interview. When she said she felt like she was bragging about herself, awww <3. I did an interview of my little sibs one year after we went to the fair, and posted it on my blog, it was soooo much fun! And these types of posts are so fun to read, too! Thank you for sharing!